One of Sen. Claire McCaskill’s (D., Mo.) final ads of the 2018 campaign sets her apart from "those crazy Democrats" in her party. The radio ad has been running over the past week in Missouri and features two middle-aged men having a conversation about the hotly contested Missouri Senate race, CNN reports. McCaskill’s Republican challenger Josh Hawley has targeted her for her liberal positions, but the ad presents her as a centrist who bucks her party. "I don't always agree with Claire McCaskill. But she works hard, fighting against those tariffs, doing all those town halls," the other man says. "Claire's not afraid to stand up against her own party." President Donald Trump won Missouri by 19 percentage points in 2016. 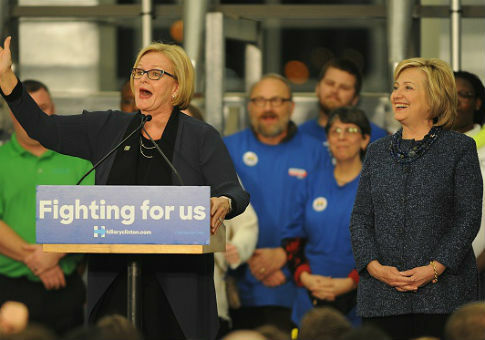 McCaskill endorsed his opponent, Hillary Clinton, although she has had to distance herself from some of Clinton’s comments after her historic defeat. The narrators of the ad also chide McCaskill’s opponent Hawley for being "a man in a hurry" and being at the gym or buying wine "during work hours." The ad’s talk of "crazy Democrats" has already rankled fellow Democrats who McCaskill needs to win in November. Missouri State Sen. Maria Chappelle-Nadal (D.) told CNN the "crazy Democrats" could refer to the party base in urban areas, including African Americans. "[McCaskill] is calling her base in the urban areas crazy Democrats," Chappelle-Nadal said, "and she's relying on those so-called crazy Democrats to make sure she wins." Chappelle-Nadal said last year she hoped Trump would be assassinated, prompting McCaskill to call on her to resign. Chappelle-Nadal apologized but did not resign, and she has taken shots at McCaskill since then. Polls show Hawley and McCaskill neck-and-neck with two weeks left in the campaign. This entry was posted in Politics and tagged 2018 Election, Claire McCaskill, Democrats, Josh Hawley, Missouri. Bookmark the permalink.